Moroccan Arabic: Helba (sometimes spelled halba) is the Moroccan Arabic word for fenugreek (Trigonella foenum-graecum). Fenugreek leaves may be used as an herb while the aromatic, bitter seeds are used whole or ground as a spice. The sprouts may also be eaten. In Moroccan cuisine, it's the whole fenugreek seeds which are primarily used as a spice. These fragrant, golden seeds most famously show up as a key ingredient in the Moroccan chicken and lentil dish of Rfissa. Due to fenugreek's ability to promote lactation, this particular dish is traditionally prepared for new mothers several days after giving birth. You'll find it served other times as well, as family meals or a company dinner, as it's a much-loved comfort food. Less commonly, the seeds are also used in some Berber cooking, such as Tagine of Peas and Fenugreek. Helba is an ingredient in a number of other cuisines, including Indian, Pakistani, Egyptian, Chinese, Greek, Turkish, and Middle Eastern. People in the West may be most familiar with its use in curries and chutneys. Fenugreek imparts a sweet, slightly nutty maple-syrup-like flavor to dishes. In contrast, you'll find a bitter note when biting into raw fenugreek leaves or seeds. Cooking generally eliminates the bitterness in the leaves, but the whole seeds tend to retain a bitter quality even if cooked for a long time. To reduce the seeds' bitter note and to soften their texture, an overnight soak in water can be quite helpful. Another option is to tie the fenugreek seeds in cheesecloth when adding them to a dish, which allows the seeds' sweet flavor to permeate the sauce or stew but makes it easy to retrieve the seeds so that they can be discarded or served on the side. In traditional medicine, fenugreek has long been used as a remedy and as a supplement. It's been shown to increase uterine contractions during labor, increase milk production in lactating women, help relieve menopause symptoms, improve glucose tolerance in diabetic patients, reduce cholesterol levels, improve libido, reduce fever and flu symptoms, improve skin problems and soothe digestive complaints including heartburn, gastric inflammation, and reflux. It's also touted as an appetite stimulant and therefore may be used to help gain weight. 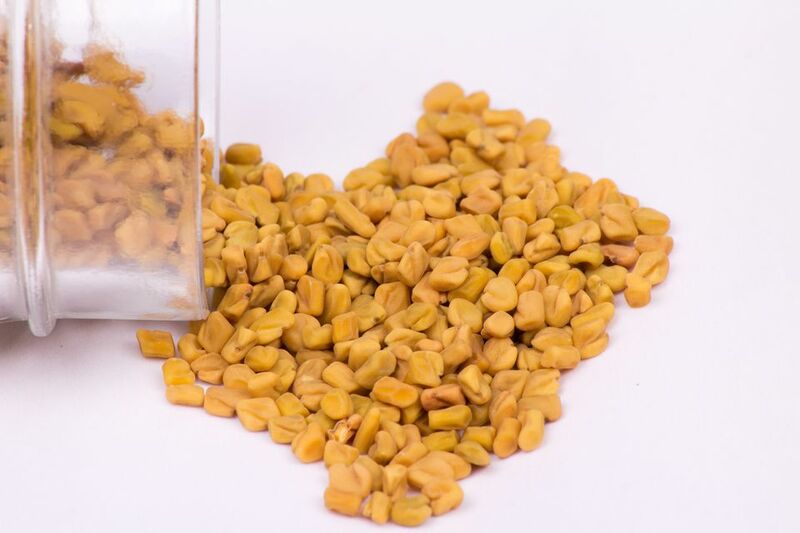 Fenugreek seeds have a sweet, pungent fragrance which can permeate a room as soon as they're exposed to air or the pot. After cooking, the sweet smell can linger in your home for a full day or longer. And, unfortunately, some find that fenugreek can linger on them as well, in the same way, that some people are prone to sweating out the scent of garlic. Fortunately the fenugreek odor is not offensive like garlic, but, nonetheless, the maple syrup odor can be quite discernible and bothersome. If this happens to you, an extra shower and frequent clothing changes may be helpful until the fenugreek is out of your system. Should I Use Bottled Lemon Juice? If Your Order Callaloo, What Are You Getting?